A recipe by Pierre Hermé. Instagram and Pinterest have replaced Flickr for my late-night food gawking. I spotted a mile-high lemon meringue tart from a Parisian salon de thé on Instagram and started baking right away. I made the sweet tart dough in advance and let it rest overnight. Again, I used my Edgeware Better Zester for the lemons which made everything so much easier and less time-consuming. 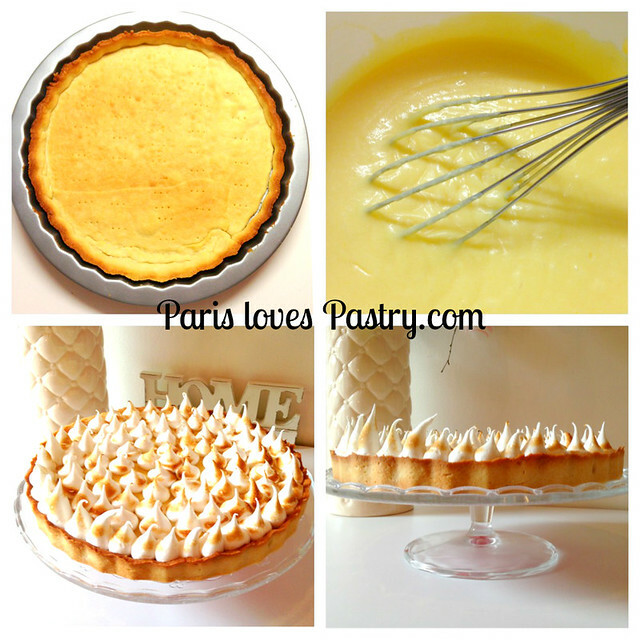 The buttery lemon cream is just dreamy!! SO hard not to lick the bowl too much because you actually need most of it. 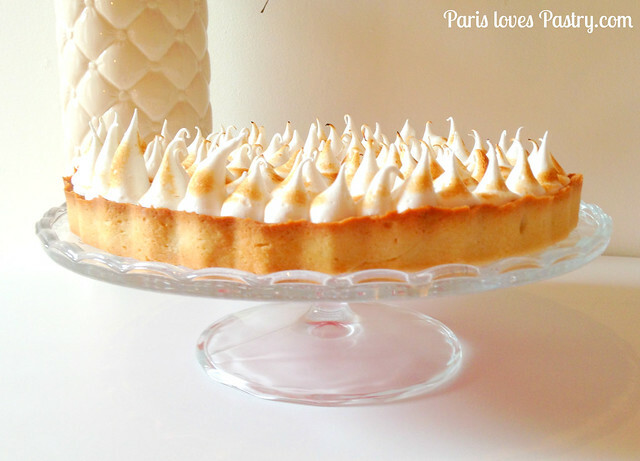 Then, I used Nigella Lawson's recipe for meringue frosting and piped little meringue-towers on top of the tart. 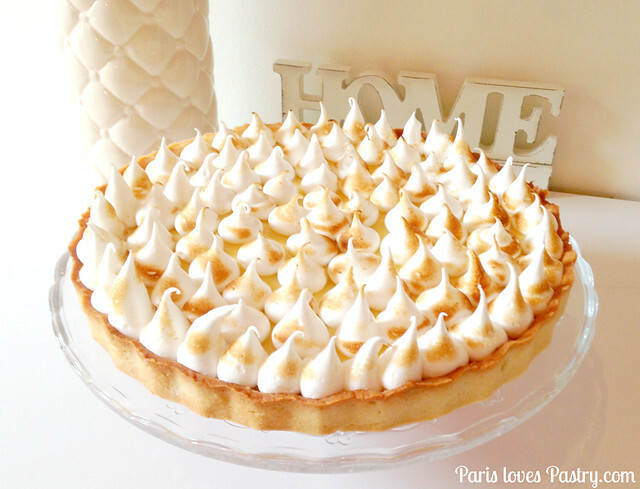 Pierre Hermé's lemon tart recipe does not call for meringue, but it is so much more delicious with a creamy topping! Rating: absolute heaven! - Gather the dough into a ball and divide it into 3 or 4 pieces. Gently press each piece into a disk and wrap each one in plastic. Allow the dough to rest in the refrigerator for at least 4 hours or for up to 2 days. (mine rested 2 hours) The dough can be wrapped airtight and frozen for up to a month. - Put a saucepan of water heat and bring water to the simmer. Place the sugar and lemon zest in a large metal bowl that can be fitted over the pan of simmering water. Off the heat, rub the sugar and zest together between your fingers until the sugar is moist and aromatic. Whisk in the eggs and then the lemon juice. - Fit the bowl into the pan of simmering water. Cook, stirring with the whisk, until the cream thickens and reaches 180°F. As you cook the cream, whisking all the while to keep the eggs from overheating and scrambling, you’ll see that at first the cream is light and foamy, then bubbles get larger, and finally, as the cream starts to thicken, the whisk leaves tracks; the tracks mean the cream is almost ready. Keep whisking, check the temperature and keep your patience; it could take as long as 10 minutes for the cream to reach 180°F. - Pull the cream from the heat as soon as it is cooked and strain it into the container of a blender or food processor. Let the cream rest, stirring occasionally, until it cools to 140°F, about 10 minutes. Make sure it is not over 140°F, before you add the butter! - Working with the blender on high speed, beat the cream adding the pieces of butter. Scrape down the sides as needed. When all the butter is incorporated, continue beating the cream for another 3 to 4 minutes. - Make a doubleboiler with a bowl that will fit snugly over a saucepan of barely simmering water. Put all the ingredients, except for the vanilla, into the bowl. Whisk everything with an electric mixer until the icing becomes thick and holds peaks like meringue. This will take for about 5 mnutes, so be patient. - Take the bowl off the saucepan on to a cool surface and keep whisking while you add the vanilla. Then keep whisking until the mixture cools a little. If you look at the right bar of this blog, you'll see that my lemon meringue cupcakes are the recipe of the week. I'm in a Spring/Summer state of baking! This looks so good! I want to make it this weekend! Thank you for posting. Summer or winter, this is such a classic and delicious dessert - but you have reminded me that i have't made it for far too long. Haven't tried a version using the almond pastry, rather than a shortcrust, so will be keen to try it on the weekend as lemons are very plentiful now that it is autumn here in australia. That looks so yum! I love lemon merengue pie and this is a work of art!!! Have a great weekend! I love lemony desserts and the old-fashioned lemon meringue pie has been a favourite of mine since my childhood. This version is definitely one to try! I cant wait to try this for the birthday party I am planning. It looks to die for and you explained it so well. Thank you. Hello. It is hard to find either golden syrup or corn syrup in my country. Do you think that I can substitute it for honey? Yes, if you can't find golden or corn syrup, honey is a good substitute! It looks so good, I would love to find it on my kitchen counter right now.